A couple of weeks ago, we had my daughter’s 8th birthday party. She waffled between several themes and I could tell she wasn’t in love with either. So I suggested she let me pick a theme and surprise her. Well, was she ever surprised! 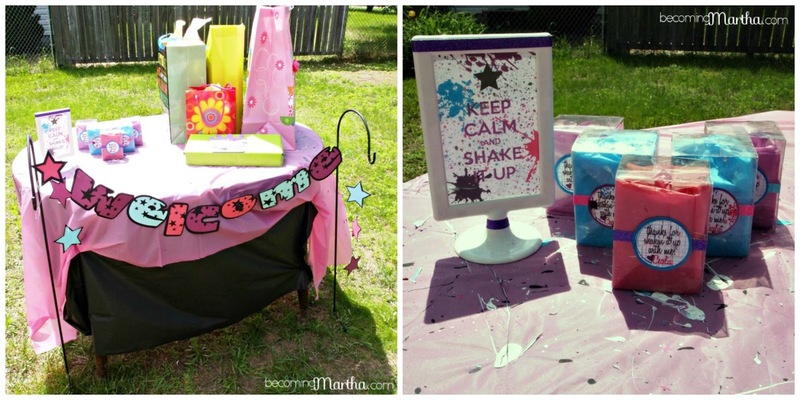 I chose a Shake It Up birthday party theme, which I knew she would love. (If you don’t know, Shake It Up is a show that airs on Disney’s Family channel, about two girls who are backup dancers on a dance show.) She is obsessed with the show – and she is also obsessed with pretending she can hip hop dance. She also loves the whole 80’s rebirth of neon, so I went really bright with the colors – a bright pink, aqua, and purple. 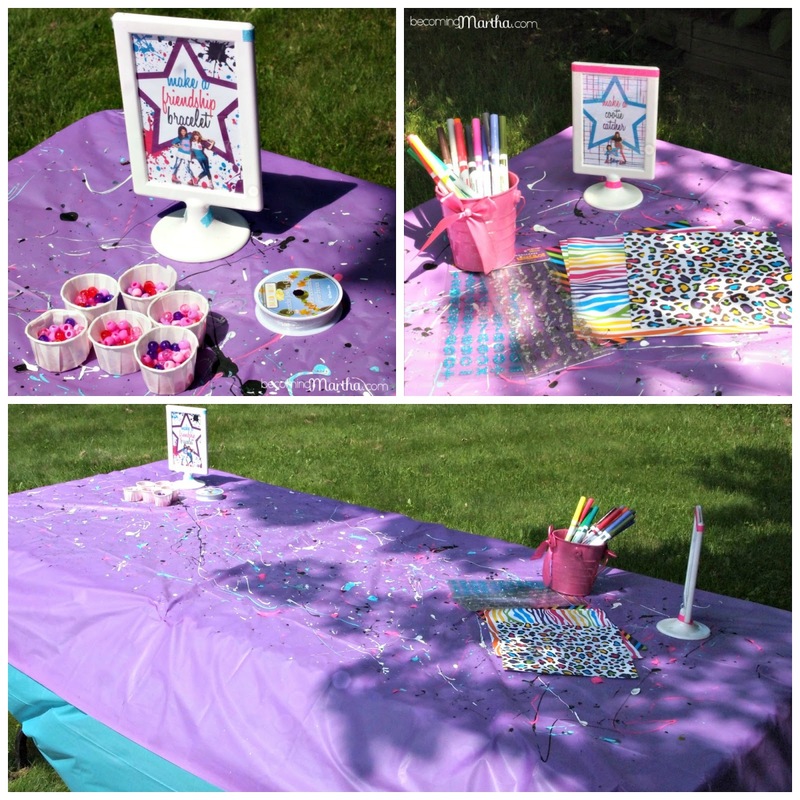 I used a paint splatter and stars pattern through out the whole party to tie it all together. 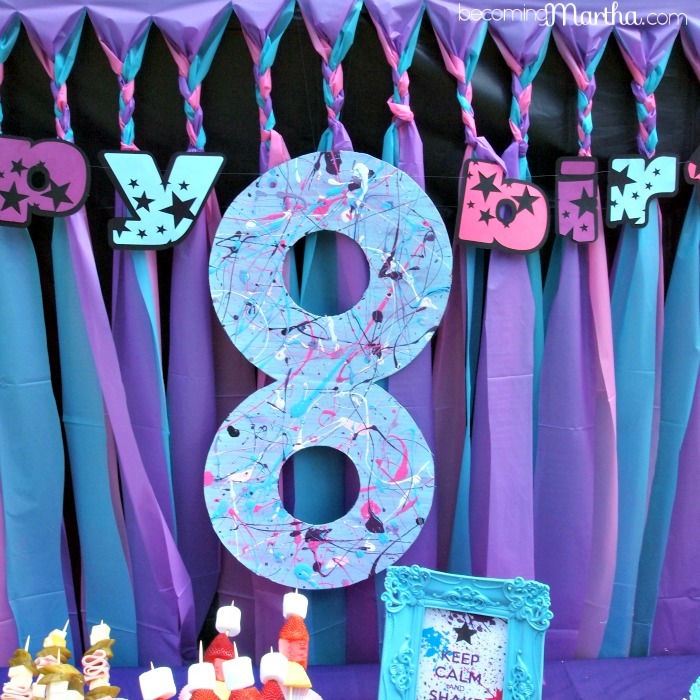 During last month’s Minnie Mouse party, I discovered how easy and inexpensive it was to use vinyl tablecloths as a backdrop. 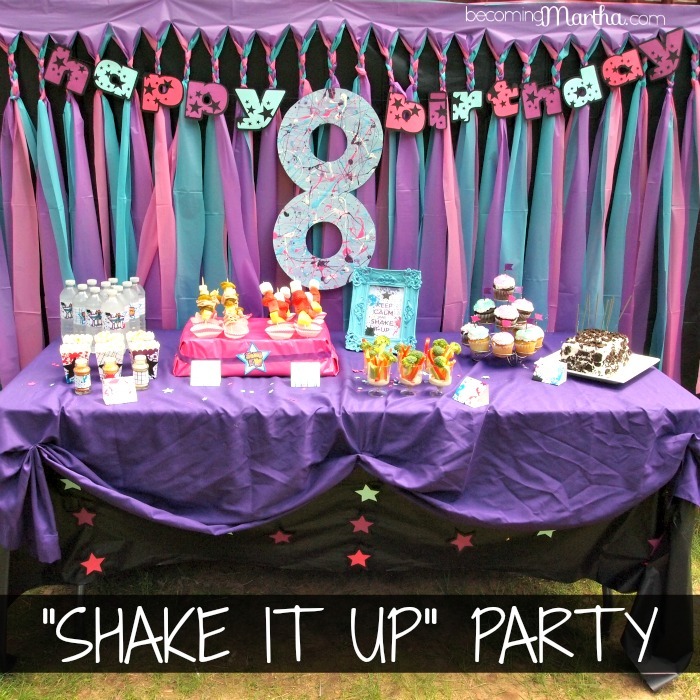 For this party, I wrapped the bottom of my deck in black table cloths, and then layered pink, aqua, and purple tablecloths over the black. I cut them in strips, and braided the top – a technique I discovered from Jenna at Rain on a Tin Roof. I also cut a big 8 from cardboard and painted it and then used a paint splattering technique (and by technique, I mean, I threw paint at it) to decorate it up. I also made a happy birthday banner by using some cardstock and my digital cutting machine. 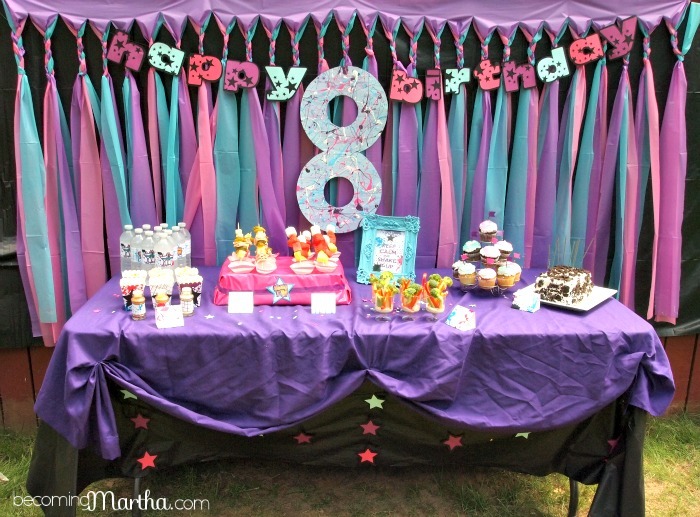 To decorate the food table, I wrapped black vinyl table cloths around the bottom and added a purple flat sheet to the top. I used some star confetti to sprinkle over the table (it was actually the stars that were cut out of the banner for the backdrop) and added some cut out stars to the black table skirt. For the food, I really wanted to keep it simple, because I hate rushing to get food out at the last minute at a party. We had a popcorn bar with various seasonings (I made those popcorn boxes myself, aren’t they awesome? ), deli skewers, fruit and marshmallow skewers, veggie and dip cups, cupcakes, and an ice cream cake. 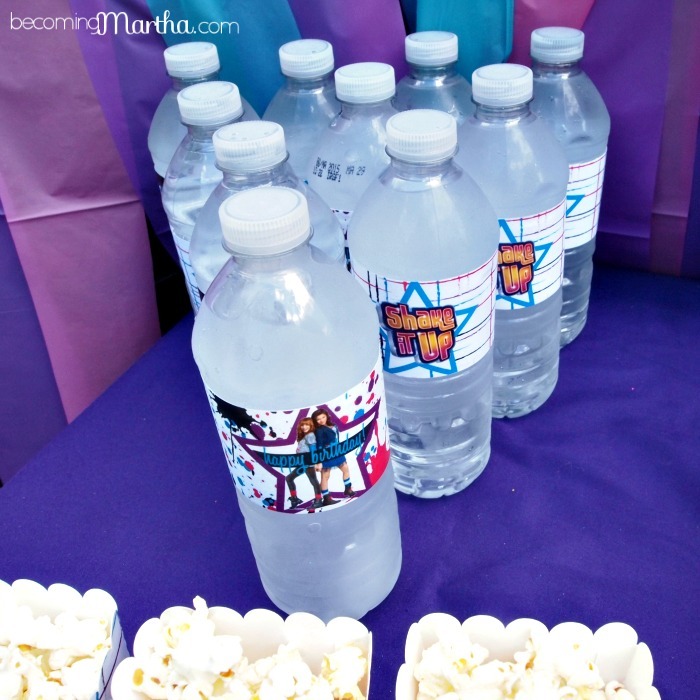 I also created water bottle labels, which I do for every party. It is such a small thing but it really adds a lot of impact. And I always have all of my printables printed at the local printing shop because it would take a whole ink cartridge I’m sure – but I had everything printed for this party for about $10! We paint splattered all of the vinyl tablecloths that we put on the tables using the same “throw paint at it” technique – my friend Kristen from Three Monkeys’ Mommy actually came over to help me do this and left covered in paint! For the table they were eating at, I used strips of colored tablecloths and wooden stars to decorate the backs of the chairs. We used the photo frame vase with some gerbera daisies as a centerpiece (you can find the full tutorial for that project here) and added bottles of blue Jones soda for each guest. I created labels for those as well, and taped a striped straw on the side with pink washi tape. As part of the activities, the girls made friendship bracelets out of pony beads and I also bought some really cool paper and rhinestone number stickers for them to make cootie catchers. 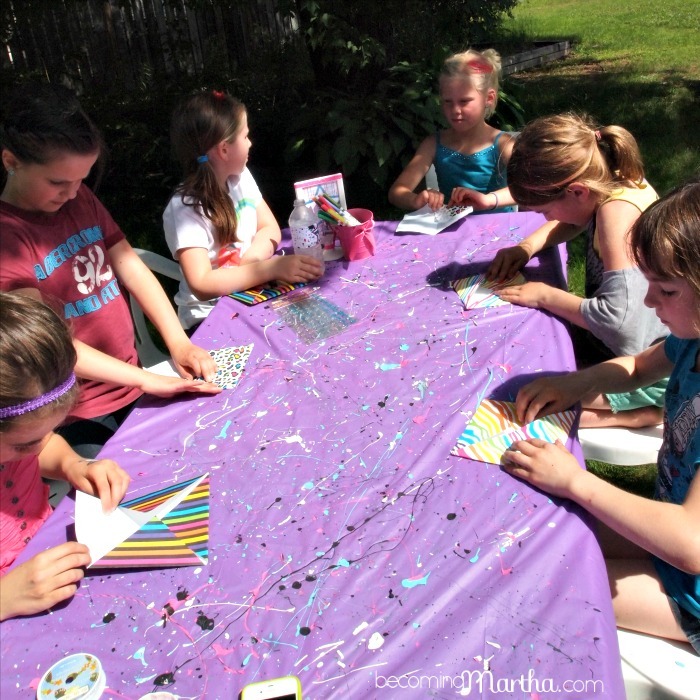 My daughter has just been madly in love with these things lately, so I thought it would be a fun addition to the party games – and I was right – the girls went nuts for them! I also set up a really simple backdrop – I stapled a paint splatter vinyl tablecloth to the side of my shed and grabbed a black frame for the girls to use for pictures. They had so much fun getting their picture taken. I always like to set up a welcome table with the favours and where guests can drop off their gifts as they come in. I decorated it with (what else) vinyl tablecloths, and used shepherd hooks to hang a welcome banner and some dangling stars. I reused little plastic boxes that we had bought some little toys in from the dollar store. I placed tissue paper inside and put in some cute little gifts that seemed to fit the theme – nail polish, lip gloss, colorful hair extension clip ins, and some temporary tattoos. I finished it off with my new favorite craft supply (glitter ribbon tape from American Crafts) and a little tag that said “Thanks for shaking it up with me”. … and more inportantly, so was this little miss! Happy 8th birthday, sweet pea! Update: If you would like to purchase these printables, they are now available in my Etsy shop. If they are not listed anymore, please contact me, and I can set up a custom listing for you. My 5-year-old loves that show too! 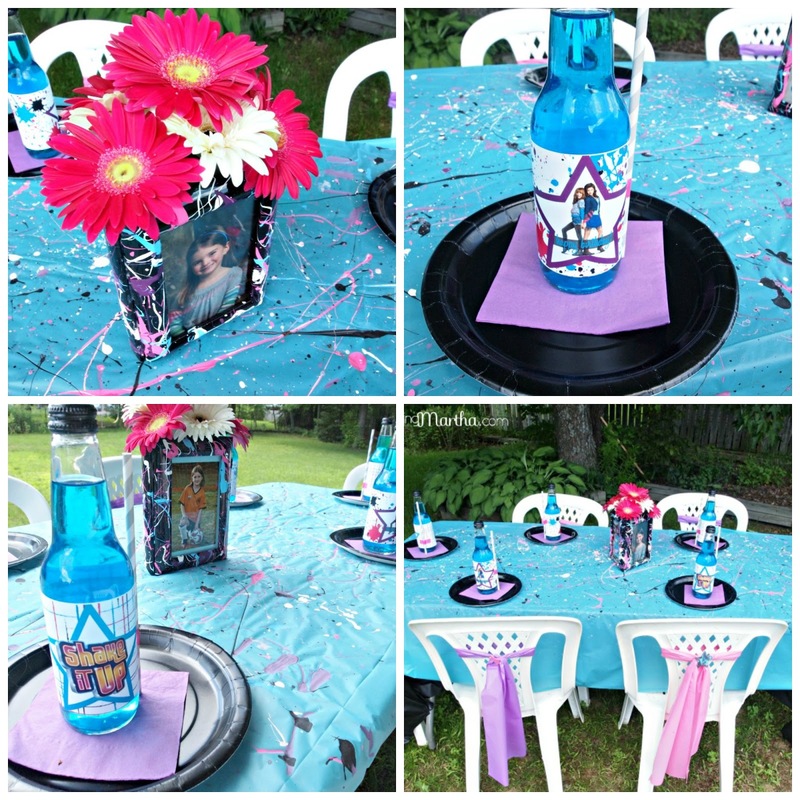 I have fond memories of the 80s, so I love the overall colors and design of your daughter’s party. How fun! Thanks so much! 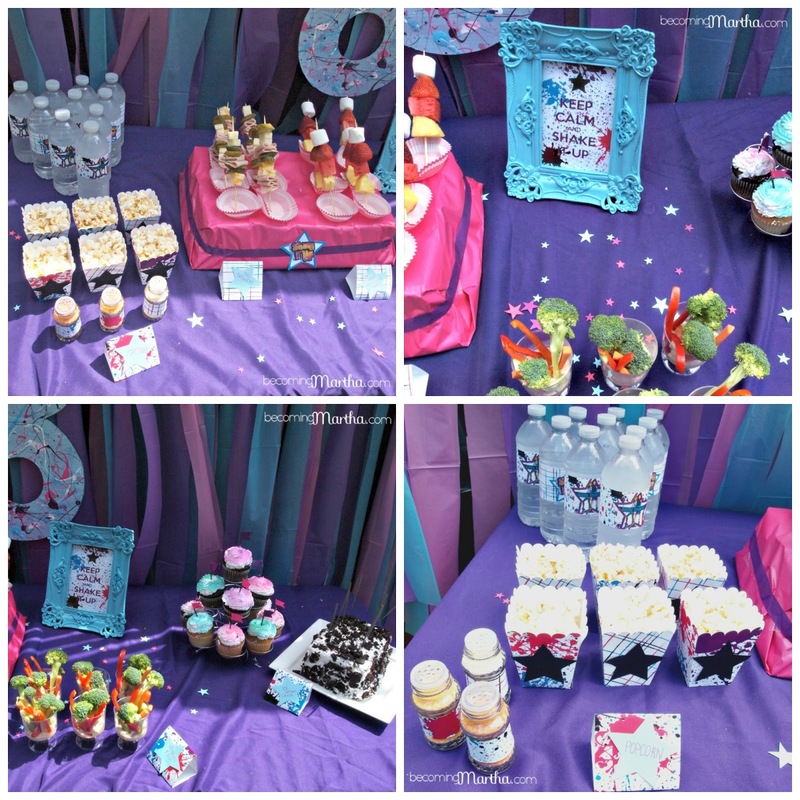 It was such a fun party to plan and throw! Thanks Chelsea! I think this was my favorite party of all the ones we’ve done. It was so much fun! My kids love Shake It Up! What a fun party. Visiting from the 36th Ave- have a great week!